The Anthem Roanoke GO Outside Festival was the biggest to date with 38,000 attendees over three days in October. Save the date for next year – Oct. 11-13, 2019. 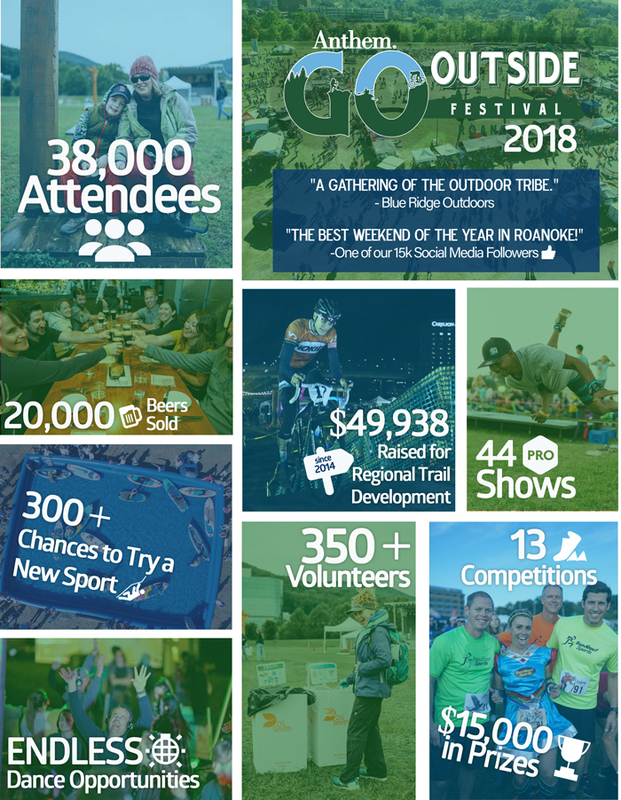 Did you know GO Fest is more than a festival? Some eight years ago the Roanoke Regional Partnership set out to leverage the region’s natural assets to attract talent and investment. The result of this initiative was the creation of the Roanoke Outside Foundation and the ensuing change of the region’s community narrative to one that places a high value on the outdoors, the environment, and active living. Events like GO Fest, the Blue Ridge Marathon, and GO Cross are integral in shaping and telling our community story. They bring people and businesses to experience the region’s natural assets and see the outdoor economy in action. It’s part of an integrated economic development strategy.